Friend of Morbid Anatomy Ky Olsen has just sent me a wonderful link: it seems the Fortean Times (in this month's "Dead & Buried?" issue!) has published a story about "Blythe House"--the storehouse that holds artifacts of the Henry Wellcome collection not currently on display at either the Science Museum or the Wellcome Collection. 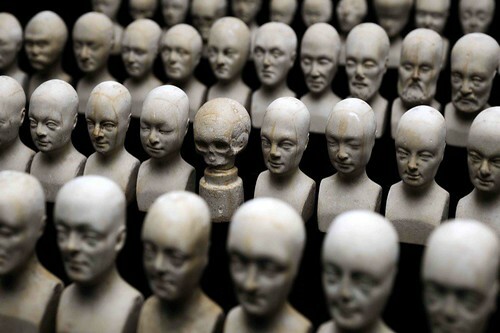 Called "Medical Cabinet of Curiosities," the piece is a sort of lyrical ode to the overstuffed storehouse, also memorably paid homage to by The Brothers Quay in their short film "The Phantom Museum." I only wish there were more photographs of the backrooms to accompany the piece, but alas. Words will have to do. Click here to read the whole article--well worth checking out! Click here to see David Pescovitz's post on Boing Boing about the article. Visit the Science Museum's infinitely browsable "Brought To Life" website, which makes this entire collection available via beautiful photos and accessible information (and from which the above image is drawn), by clicking here. For more about the Science Museum and the Wellcome Collection, see a recent Morbid Anatomy post by clicking here.